Some people find themselves easily provoked by others, and this can cause them to become annoyed much easier. While some people can brush off the annoying behaviors of others, this isn’t a skill everyone possesses. For some people it is easier to be provoked, especially when someone is actively trying to do this. 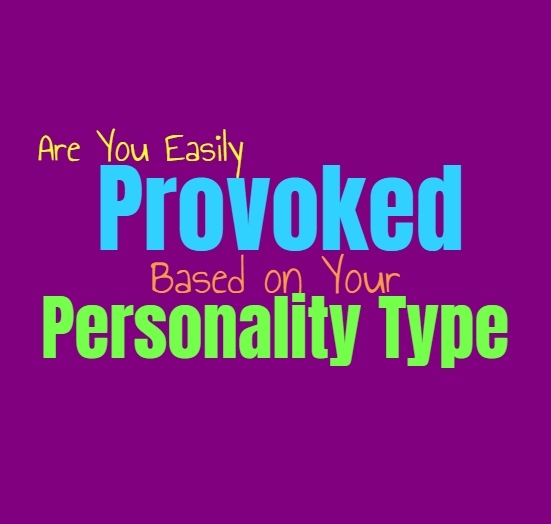 Here is how easily you can be provoked, based on your personality type. INFJs try their best not to be provoked by people, but there are times when others can get under their skin. For INFJs it can be easy to be provoked by certain people, since their tone and behavior already gets them feeling agitated. For the INFJ it often feels overwhelming after they have responded to being provoked by someone, since they don’t like feeling as if they have relinquished control in this way. They do however have tempers which people might not realize, and can become deeply annoyed with people who seek to push their buttons. ENFJs actually can be easily provoked, since they are naturally in tune with the emotions of others. When someone is actively trying to get on their nerves or provoke a response, ENFJs can easily sense this. While they might recognize what the person is trying to do, that doesn’t mean it really makes the situation any less frustrating for the ENFJ. They can sense of emotionally energy of those around them and this tension can really cause the ENFJ to feel both provoked and very frustrated. INFPs follow their emotions in order to make choices, and so this can cause them to feel easily provoked. While they might not enjoy this feeling, INFPs follow their hearts and sometimes this gets them feeling worked up. When someone pushes their boundaries then the INFP will feel easily provoked and they aren’t afraid of expressing how they feel. For them it is about following their emotions instead of burying them, since they want to work through what they are experiencing. ENFPs do find themselves easily provoked sometimes, especially by people who tend to get under their skin. ENFPs do sometimes find themselves provoking others intentionally, but this is something that can also be turned back around. They find themselves responding when someone actively tries to provoke them, especially when someone continues to push these buttons without ceasing. They don’t enjoy when someone is trying to get on their nerves and when certain lines are crossed they do find themselves retaliating. INTJs try not to allow people to provoke them or force some sort of reaction. They don’t like focusing on their emotions and so INTJs are often better at ignore these negative situations. When they are dealing with someone who constantly tries to provoke them, INTJs do their best to shut this person down instead of really responding by being upset. If this goes too far they aren’t afraid of finding ways to retaliate in order to make this person stop, but for the INTJ it isn’t about being provoked it is simply about setting boundaries. ENTJs don’t like allowing their emotions to take control of their actions, and so they try their hardest to avoid letting others provoke them. When someone is actively trying to get on the nerves of the ENTJ, they simply do their best to shut them down and ignore their actions. They do sometimes find themselves provoked by people who are being inefficient, especially when the ENTJ has to clean up after their messes. They don’t like feeling provoked since this leaves them feeling less in control, but there are times when people just push their buttons. INTPs don’t like allowing others to provoke them, but they can be shaken up when someone continues to try and push their buttons. INTPs often recognize when someone is attempting to aggravate them, and so this can start to really make them feel frustrated. They will do their best to let this roll off their shoulders and they don’t want people noticing that they are provoked. For the INTP it is often easy to hide their emotions, and so even though they feel frustrated they don’t let someone provoke them enough to respond outwardly. ENTPs do sometimes feel provoked easily by people, but that’s because they enjoy debating and taking on new challenges. For the ENTP sometimes being provoked is entertained and so they allow themselves to get worked up by someone. This is because they also enjoy being able to take on the debate and prove someone wrong by using facts and intelligent arguments. For the ENTP it isn’t always that they are provoked and upset by it, but they do find themselves responding when someone tries to push their buttons. ISTJs don’t like letting their emotions control them and so they do their best to avoid letting people provoke them. ISTJs can be rather good at ignoring people, especially the ones they find truly frustrating. They simply try to avoid people who will seek to provoke them and don’t want this type behavior in their lives. ISTJs value efficiency and so they are more easily provoked by someone not following instructions and simply getting in their way when they are trying to get something done. ESTJs try not to let people provoke them, but they do find themselves easily annoyed by others. ESTJs will be especially provoked when someone is completely inefficient, and become frustrated by people who get in their way when they are trying to get something done. For the ESTJ it can be easy for them to feel provoked when they are trying to work on something important and others seem to be making it challenging for them. ISFJs try not to let others provoke them and would rather control their reactions. They seek to keep harmony in their environment and so this does help the ISFJ avoid confrontation. They don’t want to get into arguments with people and would rather keep the peace whenever they can. If someone continues to try and push their buttons it can become a little bit frustrating for them, and so they might find themselves feeling a bit annoyed and provoked. ESFJs try not to let people provoke them and most of the time they are good at containing their emotions. They try hard to get along with others and want to be able to please their loved ones. For the ESFJ allowing themselves to feel provoked when they should be in control, feels a bit like a failure. If someone continues to actively attempt to push the ESFJ buttons then they can become provoked and likely to snap on this person. ISTPs don’t like allowing their emotions to take control and so they aren’t easily provoked by others. If someone is annoying the ISTP they want to ignore them, and try their best to block this person out. For the ISTP it is best to avoid getting worked up and don’t want to let other people affect them this much. For them it is easier to let things go and focus more on doing things their own way. ESTPs don’t like allowing people to provoke them but they can be worked up easily when someone is annoying them. They live so much in the present that sometimes they can allow their momentary frustrations to get the best of them. ESTPs don’t like feeling pushed around and when someone is clearly trying to provoke them it can leave them wanting to retaliate. ISFPs don’t like letting people provoke them, but they follow their emotions where this might lead them. The fact that ISFPs follow their feelings in the present moment can cause them to react to people who are trying to provoke them. When people push their buttons the ISFP will have a hard time holding back and will find themselves feeling easily provoked by this. ESFPs can definitely be easily provoked, especially when someone is actively trying to push their buttons. They follow their hearts and do what feels right for them in the moment. Their feelings sometimes cause the ESFP to find themselves responding when someone tries to push their buttons. For the ESFP it can be easy for someone to push them towards feeling provoked, especially if that is their intention.